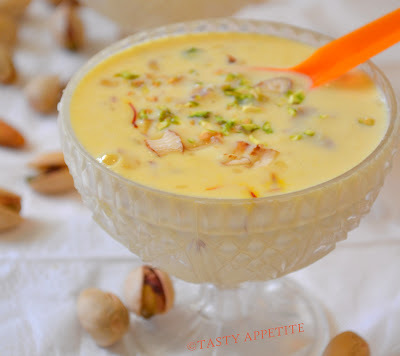 Basundi is a very popular Gujarati sweet dish made with milk and lots of dry-fruits. First of all, take a large thick bottomed utensil and pour milk in it. Boil the milk with continuous stirring on low flame till half and make sure it does not stick to bottom or sides. Once the milk is reduced to half; add few strands of saffron (kesar) in it. Add chopped nuts and cook for 3-4 minutes and then add cardamom powder and nutmeg powder. Keep cooking this on low flame. Now add lemon juice with care in the milk as it provide a grainy texture to milk. Serve it… hot or cold by garnishing with chopped nuts. Cook the milk till end on low flame. Adding nuts will make the milk thicker. By adding nutmeg and cardamom powder ; enhances the rich flavor. It attains thicker consistency on cooling. Gives a great taste after cooling.